Some readers may already have heard of the HTC One Max, which until recently was dubbed the HTC T6. This upcoming smartphone sounds pretty impressive, and today we have a claimed blueprint of the device to show you. The same source also cites a Q3 release for the HTC One Max and adds a few more details to earlier rumored specs. We’ve previously given some leaked specs for the HTC One Max and more recently took a look at it compared to the upcoming Samsung Galaxy Note 3. Although this is not an actual photo of the device we can show you a blueprint sketch of the HTC One Max (below) that reveals some of the dimensions of the handset. This blueprint shows it to be 140.4mm in length and 9.4mm thick and reveals a display size of 5.9-inches. 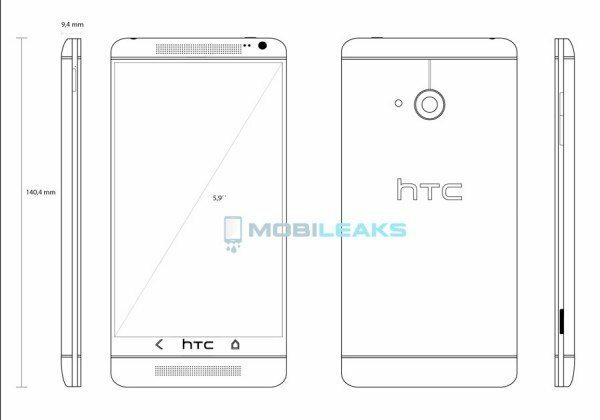 We can also see that the HTC One Max will have very slim bezels and the two front-facing speakers that have been rumored, known as Boom Sound, are also depicted. The same source also lists a 2.3GHz Qualcomm Snapdragon 800 quad-core processor, full HD display resolution of 1920 x 1080, 3300 mAh battery and an UltraPixel camera, as on the existing flagship HTC One. Much of this tallies with specs we have previously reported although we have also heard of 2GB of RAM and 16GB of internal storage for the device, along with expandable storage via microSD. As well as this we’ve also heard mention of a 2.1-megapixel front-facing camera, 1250 mAh protective case and possibly a rear fingerprint reader. According to the source it will run either on Android 4.3 or 5.0, often referred to as Key Lime Pie. A release for the HTC One Max is scheduled for Q3, and it will be available in regions worldwide. This release timing is likely to see it launch at approximately the same time as the Samsung Galaxy Note 3, which could make for an interesting competition to follow. You can be sure we’ll be following all of the developments of the HTC One Max over the next few months, and it looks like an exciting time ahead for fans of phablet-style Android smartphones. Do you like what you’ve heard about the HTC One Max (T6) so far? We’re always interested in what our readers have to say, so do send us your comments about this. A 5.9″ display would be ~130mm tall, but the display in this blueprint looks to be – based on the propotions – ~110mm tall. That’s about 5″. So something’s off here. But I’d love to see bezels this thin on a tablet/phone. You’ll see bezels this thin on a tablet phone when the Galaxy Note 3 is released in a Galaxy S4-esc way. Exactly, a 5.9″ screen is 131mm long…. how can it fit in a 140mm long body and still have a home button, logo, speakers and enough strength? I can see those dimensions with that 5.9″ screen, but how is boomsound going to fit while staying under the length of the butterfly? Can’t wait to see the final product! HTC has taken way way too long! This is exactly the phone I’ve been waiting for. Don’t like Samsung cos it doesn’t has auto fit feature which fits a webpage to the size of the screen when the font is increased. For those far sighted and need to increase the font size and who google a lot, it is heavenly to read without having to scroll to the right, then left then down. Yep this is one phone I am so looking forward to . I simply CAN NOT wait for this behemoth to come out!!!!!!! I’m currently using the Note 1 and have not been impressed with my first Samsung smart phone at all! (Save for screen size). I’ve always had HTC (fanboy I guess). Almost went out and purchased the HTC One after my brother-in-law bought it.Thankfully they were having supply issues because now instead of being stuck with a “small” HTC One I’ll be able to have my cake and eat it too!! !